Sat, Aug 4, 2018, 11:55 pm SL Time, ColomboPage News Desk, Sri Lanka. Aug 04, Colombo: Action for Nature has recognized Sri Lankan teen Anya de Saram-Larssen as a 2018 International Young Eco-Hero among 18 others for her creative project aimed at solving the world's environmental problems. The San Francisco-based nonprofit organization bestow 2018 International Young Eco-Hero Awards on 19 environmental activists ages 8 to 16, from nine countries for their impactful environmental projects addressing climate change, energy conservation, wildlife protection, landfill waste, and water pollution. Anya de Saram-Larssen, age 13, of Colombo, Sri Lanka, addresses the conflicts between humans and elephants in rural Wasgamuwa by writing, speaking, and fundraising for an "elefriendly bus" which now safely transports school children who previously had to walk through an area where dangerous encounters with elephants have occurred. In rural Sri Lanka, children sometimes had to miss school because of heavy rain and danger from elephants on the five-kilometer route. 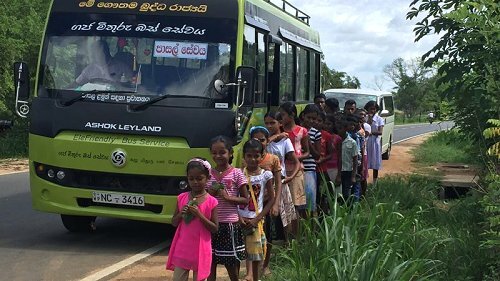 But now, thanks to the work and fundraising of Anya and the Sri Lankan Wildlife Conservation Society, they can travel safely on an "Elefriendly Bus." "Elephants are an important symbol of Sri Lanka for me and I want future generations to be able to live together with these giant, beautiful creatures," explains Anya. Through her writing, videography and speaking out, Anya is educating her community on ways that humans and elephants can co-exist. She is currently working on a pilot project bringing seven students from the Sri Lankan capital of Colombo to Wasgamuwa for a weeklong wildlife camp.